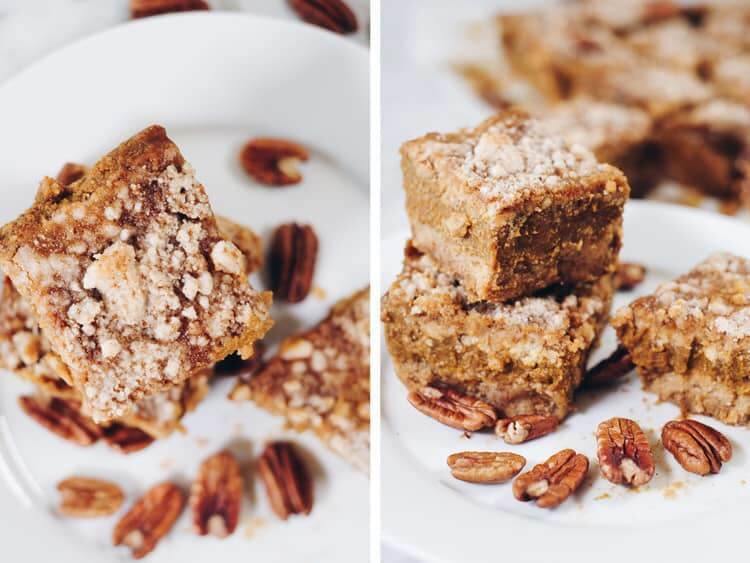 Pumpkin, crumbly goodness is exactly what these Paleo pumpkin bars are! They’re super versatile because you can really make them into any shape you’d like – bars, a pie, single serve in a muffin tin, in jars, etc. 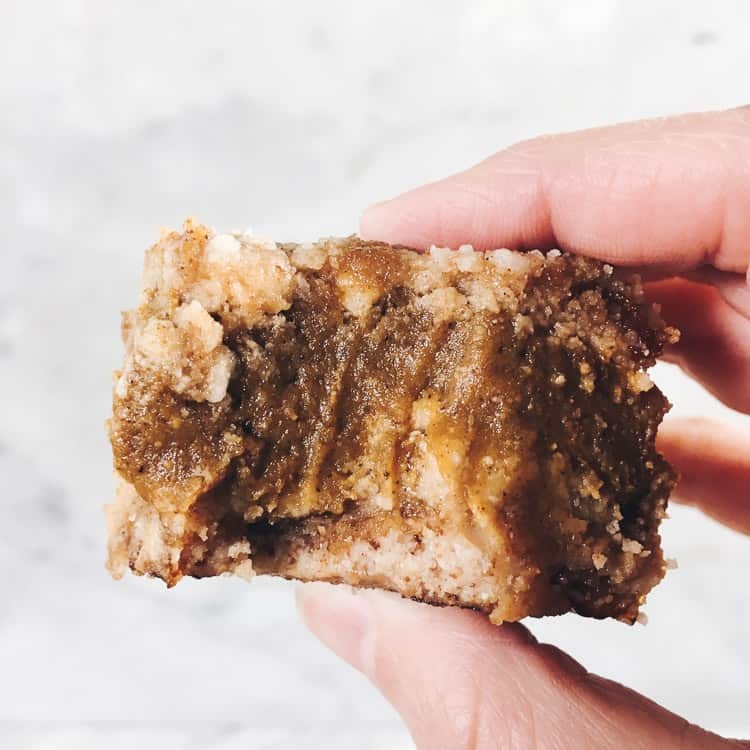 The possibilities are endless, so get creative and make these Paleo pumpkin bars your new favorite holiday season treat! 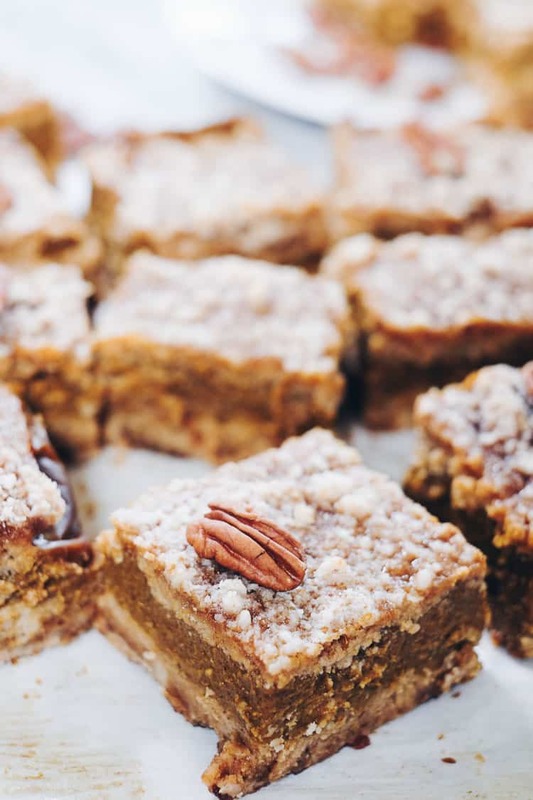 The crust and crumble for these Paleo pumpkin bars are made with the same ingredients. It’s a crumbly mixture made with blanched almond flour, coconut butter, coconut oil, coconut sugar and some cinnamon. The magic happens when you press the mixture into the bottom of the pan because when it bakes it turns into this cookie like crust. Then, you just sprinkle the remainder of the loose mixture on top, and it’s like a crumble topping. It’s such a time saver to use the same recipe for both the crust and crumble. Then, make sure you line your pan with parchment paper so that you can easily cut them into bars once set. You make the pumpkin filling on the stove real quick while the crust is baking. It’s essentially just a can of pumpkin puree, coconut sugar, coconut milk and some spices. Then, the ingredient that gives the filling it’s amazing texture is gelatin. Read more about what gelatin we use below. The key piece to this part of the recipe is using gelatin. We like to use grass-fed gelatin from Perfect Supplements. We only used a little bit of gelatin, so as it sets the filling becomes like a thick pudding rather than like jell-o. It will remind you of pumpkin pie filling, but without the eggs. 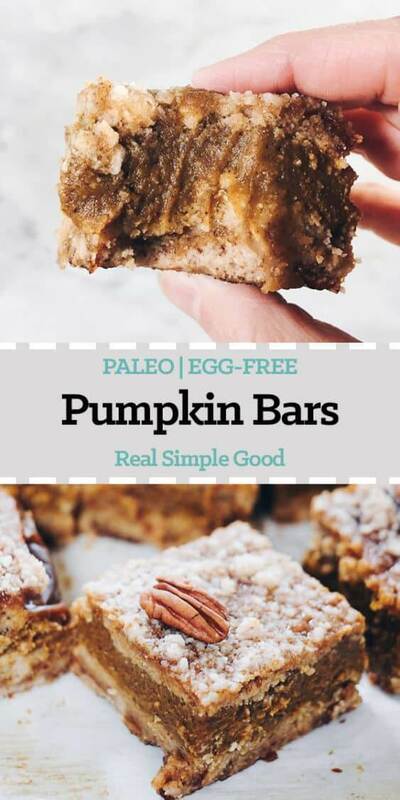 These delicious Paleo pumpkin bars are filled with all the fall flavors you’re craving without dairy, gluten, eggs or refined sugar! This recipe calls for coconut butter, which you can purchase at health food stores, but you can also make it quite easily at home. The video for our No Bake Paleo Coconut Butter Cups recipe shows you how to make coconut butter at home in a food processor. It’s super easy. All you have to do is process shredded coconut until it turns into a smooth, buttery texture. There is a video in the post, so make sure to hop over and check it out at the link above. Also, make them because they’re another yummy treat! 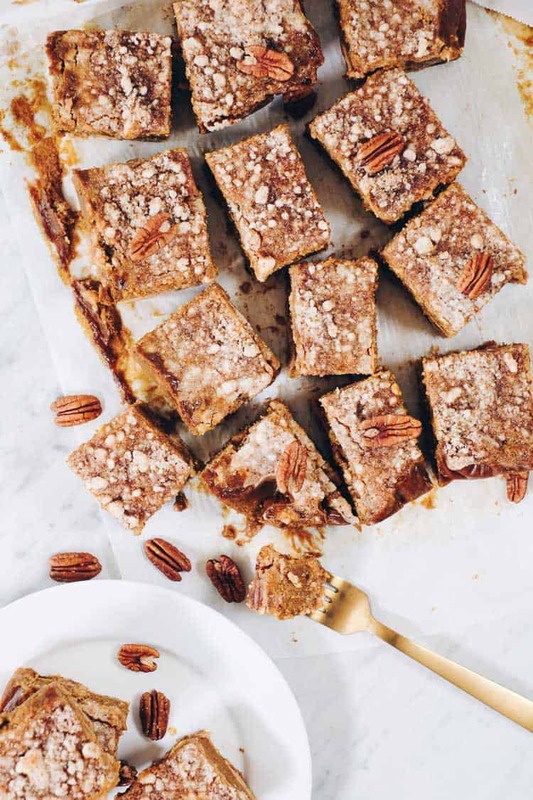 Ready to take your fall baking game to the next level? All of your family and friends will be craving these Paleo pumpkin bars, and they won’t even know they are missing the dairy, gluten, eggs or refined sugar! Let us know how it goes by leaving a comment below. Also, take a photo and tag us with the deliciousness on Instagram @realsimplegood! 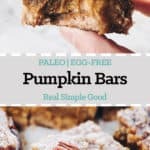 These delicious Paleo pumpkin bars are filled with all the fall flavors you're craving without dairy, gluten, eggs or refined sugar! Start by placing your coconut butter jar in a bowl of hot water to soften it. Preheat oven to 350° fahrenheit, and line a square pan with parchment paper. Then, get your crust/crumble going. Place all of the crumble/crust ingredients, except for the coconut butter and oil, in a large mixing bowl. Use a fork to mix the ingredients up a bit. Add coconut butter and oil. Use fork to mix ingredients, until little crumbles form. You don't want to over mix. Keep the crumbles alive. Place about 2/3 of the crumble/crust mixture in the pan. Press it down to make the crust layer. Place in the oven to bake for 20 minutes. While the crust is baking, place a large sauce pan over medium heat and add all of the filling ingredients except for the warm water and gelatin. Stir to combine and heat until mixture is warm throughout. While the pumpkin mixture is heating up, combine warm water and gelatin in a small bowl. Whisk to combine. Add gelatin to pumpkin mixture and stir in to combine all of the ingredients. Remove from heat. Once crust is done in the oven, remove and layer pumpkin filling mixture on top of crust. Sprinkle the remaining crumble mixture on top. Place back in the oven and bake for another 15 minutes. Remove from oven and let cool enough to place them in the fridge to set. Once set, slice and serve. They go great with a little coconut cream whipped cream or vanilla ice cream! Enjoy! **We like to make these the night or day before we want to serve them so they have plenty of time to set in the fridge. Wow! Is it bad that I’m craving these for breakfast right now?! That crust is killer! What sized can of pumpkin puree? There are LOTS of sizes of cans.